While there is no shortage of e-book readers on the iPhone and Android devices, including Amazon, Barnes and Noble, and Apple’s own iBooks, Sony plans to release their own “Sony Reader”. Slated for release next month, the Sony Reader app will give you access to all content you already purchased through the Sony Reader Store and, of course, the ability to purchase new content. Some of the notable features of the app include highlights, notes, bookmarks, and the ability to adjust fonts. 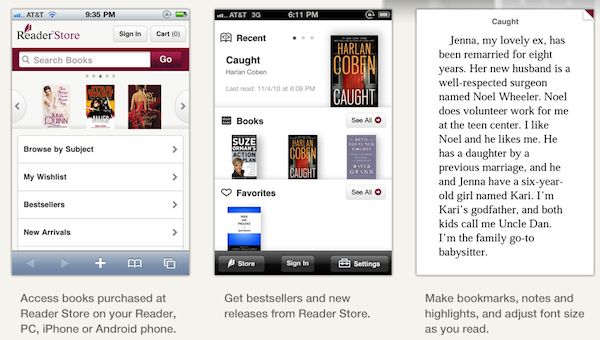 The Sony Reader app for iPhone and Android devices is expected for release sometime next month. Well, here it is, New Year’s Eve and neither hide nor hair of an iPhone, iPad or iPodTouch reader application. To the question who needs another e-reader app, it is really more a matter of being able to read all of your previously purchased ePub from Sony on other devices (i.e. other than the Sony eReader).